Our second annual S&P 500 study revealed dramatic growth in the number of companies who have invested in making their websites (and IR websites) mobile-friendly. The percentage increased from 68% to 80%. In addition, companies increasingly embraced making their Proxy Statements easier to consume by adding a "proxy summary" section. The percentage increased from 49% to 61%. However, there was only a modest growth from 10% to 11% in companies presenting their Proxy Statements in a format that embraces their mobile investors. A significant uptick from 68% to 80% of the S&P 500 have invested in making their websites mobile-friendly. This trend shows how companies value reaching their customers on all their platforms. (For more information on mobile trends, see our Tablet and Smartphone Trends page). 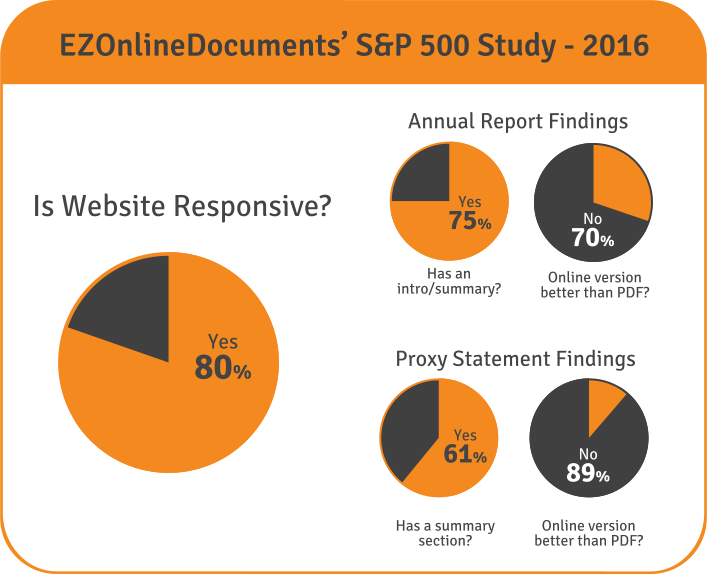 Companies have continued their efforts to add an introduction/glossy section to their Annual Reports (75%), and Proxy Statements saw a large uptick in the use of proxy summaries (61%). These trends are very encouraging as companies seek to make their information easier to consume. Use of mobile-friendly technologies is much lower when presenting the Annual Report and Proxy Statements. 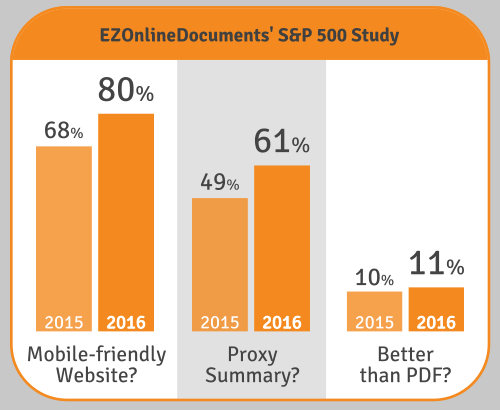 70% of companies are still using PDF instead of HTML/Interactive or better technologies for their online Annual Report, and a dismal 89% of companies are using PDF for their Proxy Statement. In spite of many cost-effective methods to make these documents mobile-friendly, companies are still struggling to reach their mobile investors. The lack of attention for mobile investors squanders the efforts companies have made in adding easy-to-read introduction/summary sections. High use of PDF has some very significant disadvantages — especially on stock Apple products such as the iPad and iPhone. These stock Apple systems come with a built-in PDF reader that lacks full-text search, bookmarking, or cross-linking... failing the SEC rules and recommendations! The cost to post documents that are better than PDF is minimal, and there are investors who use mobile technologies and are failing to receive usable, SEC-compliant documents because of PDF shortcomings.